Save by pairing your lodgings and airfares. Expedia has loads of epic Hyderabad holiday packages that'll save time and give you more cash to splurge! Savings of as much as 59%* are available to savvy vacationers who secure a package deal on Expedia. Look through our intercontinental database of more than 400 airline partners and 321,000 properties worldwide. Too many on there to pick from? Don't worry — we'll help you decide! Not sure about your booking? You won't pay us a cancellation fee if you change almost any reservation. Almost ready to jet off on your Hyderabad holiday? Haven't got a clue what to add to your travel schedule? Don't fret — we'll give you a few hints. Hyderabad and the Charminar are almost inseparable. A trip here wouldn't be complete without checking out this famous attraction. With wonders such as Golconda Fort and Inorbit Mall, there's never a dull moment in this animated city. When you've finished looking around those, move on to Chowmahalla Palace and the Birla Mandir Temple. You don't have to know your Michelangelos from your Boticellis to admire the displays at Salar Jung Museum. It displays an excellent array of exhibits that'll capture your interest and let your imagination run wild. Visitors in this destination have an abundance of choice. Spoil the child inside you with a hair-raising day out at Snow World! Fun, food and rides aplenty — it doesn't get any better than that! Still got time on your hands? Try to imagine the stories hidden in the walls of Purani Haveli as you marvel at its lovely facade. While Hyderabad does have 138 accommodations to choose from, it's always good to reserve a room beforehand. Not sure where to begin? Expedia is here to help out with your next luxury getaway or cheap holiday. If you enjoy living the high life every so often, why not spend a bit extra and indulge yourself at the Taj Falaknuma Palace (Engine Bowli Falaknuma) or the Park Hyatt Hyderabad (Road No. 2, Banjara Hills)? If you don't fancy spending such big bucks, why not spend your evenings somewhere less expensive? Have a look at THE ICONHOMES (Opp Cyber Gateway, Behind Cyber Tower) or the GenX Banjara Hills (8-2-703/4/B/1A, Road # 12). We don't think the airport will be the most memorable part of your getaway, but there's nothing like the thrilling feeling of knowing that your trip to Hyderabad is a mere plane ride away! Once you've landed at Rajiv Gandhi International Airport (HYD), you'll be 10 miles (16 km) from the middle of town. Visit this park to see animals running wild in safari habitats and learn about some of the 160 rare and exotic species housed here. This gold-domed mosque sits just west of the city center and serves as a memorial to Muslim saints from the Nizam era. Come to this peaceful haven in the suburbs to see one of the oldest temples in the city and to enjoy a stunning lake and picturesque scenery. Love fables generate a romantic aura about this old building with its perfect acoustic sound. Today restaurants and theaters surround the complex. In the late 16th century, this monument was erected to celebrate the end of a plague. Now, it is one of Hyderabad’s most famous landmarks. Visit these ancient ruins and wander around mud walls to learn about the mosques, palaces and artillery of an ancient civilization. See a collection of vintage cars and family heirlooms in this regal palace with scenic gardens, grand structures and baroque interiors. The world’s longest wardrobe, vintage cars and precious antiques adorn this royal palace that fuses European and Indian styles of architecture. With space for 10,000 people at any one time, this enormous mosque is one of the most sacred sites for Muslims in Hyderabad. This is the only site in the world where all the rulers of one clan are buried. It is said to be the oldest attraction in Hyderabad. Located along the shore of Hussain Sagar lake, this park combines a relaxing setting with spectacular musical fountains and a laser show about Hyderabad. This peaceful site blends various spiritual sects and architectural styles. Enjoy scenic views of the sunset and the illuminated temple at night. Journey through time, from the 2nd century through to the 20th, as you browse books, artworks and other fascinating items gathered by the adventurer Salar Jung. Take a trip back in time at this old palace to see how one of India’s former ruling monarchs lived. Located near the airport, this family-friendly hotel is within 12 mi (20 km) of Wonderla Amusement Park, Charminar and Salar Jung Museum. Chowmahalla Palace and Laad Baazar are also within 12 miles (20 km). 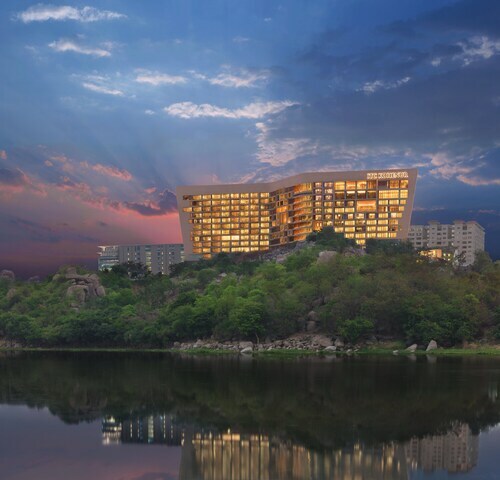 This family-friendly Hyderabad hotel is located in the business district, within 2 mi (3 km) of Kasu Brahmananda Reddy National Park, GVK One Mall and Hyderabad Central Mall. Durgam Cheruvu Lake and Birla Mandir Temple are also within 6 mi (10 km). This family-friendly Hyderabad resort is located near the airport, within 3 mi (5 km) of Hyderabad Central Mall, GVK One Mall and Asian Institute Of Gastroenterology. KIMS Hospitals is 2.2 mi (3.6 km) away. Hyderabad Begumpet Station is 18 minutes by foot and Hyderabad Sanjivaiah Park Station is 26 minutes. 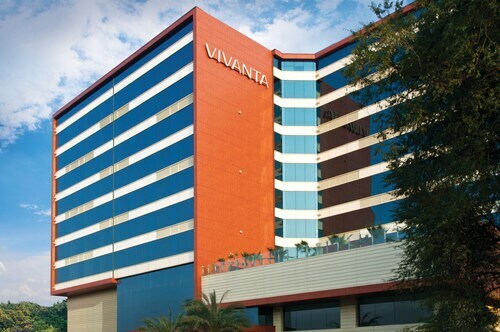 Located in HITEC City, this luxury hotel is within 1 mile (2 km) of Shilparamam Cultural Village and Cyber Towers. HITEX Exhibition Centre is 1.9 mi (3 km) away. Located in Banjara Hills, this hotel is within 3 mi (5 km) of Abids, Lumbini Park and Snow World. Golconda Fort and Salar Jung Museum are also within 6 mi (10 km). Hyderabad Khairatabad Station is 20 minutes by foot and Hyderabad Lakdikapul Station is 26 minutes. 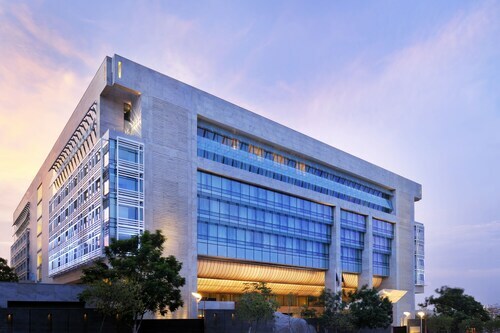 This family-friendly Hyderabad hotel is located in the entertainment district, within 1 mi (2 km) of GVK One Mall, Hyderabad Central Mall and Asian Institute Of Gastroenterology. Abids and Birla Mandir Temple are also within 3 miles (5 km). Hyderabad Khairatabad Station is 21 minutes by foot and Hyderabad Necklace Road Station is 30 minutes. 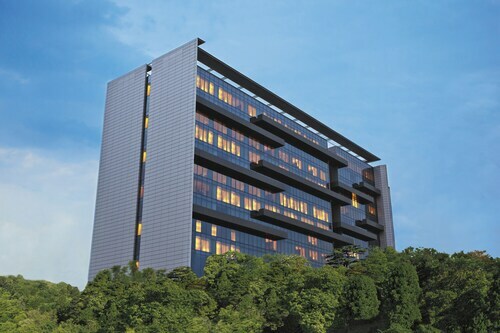 Located in the heart of Hyderabad, this luxury hotel is within a 10-minute walk of Ascendas IT Park and Inorbit Mall. Mindspace IT Park and Hyderabad International Convention Centre are also within 6 mi (10 km). 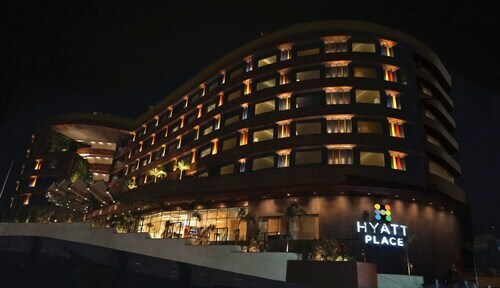 This family-friendly Hyderabad hotel is located in the historical district, within 1 mi (2 km) of Asian Institute Of Gastroenterology and Hussain Sagar Lake. Lumbini Park and Birla Mandir Temple are also within 3 miles (5 km). Hyderabad Necklace Road Station is only a 2-minute walk and Hyderabad Khairatabad Station is 18 minutes.